Are you interested in helping me design your one-of-a-kind unique bag whether it is for your wedding dress, bridesmaids,an evening bag for that special dress or just an everyday bag that you want to design yourself? Do you love the Jenni bag, but don't like the fabric it's made in? You get to contribute your thoughts on things such as color, fabrics, closures, pockets and the size of the bag. All you have to do is sit back and wait 10 - 14 days for your item to be made and shipped out to you. I love creating custom bags, so stop by my site today and place your order. I just finished creating a diaper bag for an old, well not so old classmate of mine. 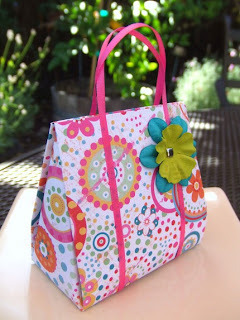 This bag is available only as a custom order only. Take a look at our fabrics page or contact me and we can find a fabric to your liking. See our custom order policies for more details. This bag measures a roomy 16" wide by 12" high and 6" deep. There are 5 roomy pockets on the outside; one with a flap and velcro closure. There are also 6 roomy pockets and lots of room on the inside. The straps measure 34 inches long and have a 16 inch drop from the shoulder. The bag closes with a zipper. Price starts at $50. Head on over to the Smell Good Spa's blog to enter for your chance to win one of Myla's Bags Downtown Clutch Bags. Also up for grabs is a pair of very cute Green Goddess Jeweled Bra Straps by Uzuri Designs. Click here for your chance to win these 2 items. Also make sure you stop by Smell Good's blog each month as she featured other wonderful Indie Artists.